This is the longest venomous snake on the planet, and they get to around 6 meters long (19 feet!). 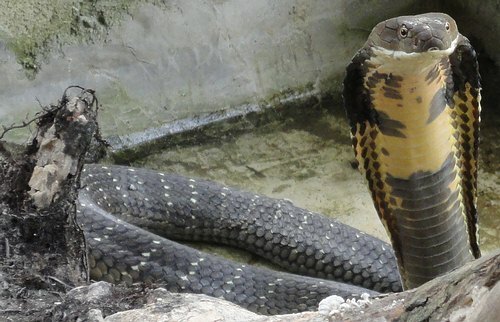 The King Cobra length isn’t the scary part, it’s the amount of venom they can inject with one bite – which can kill an elephant. The brother of a friend I have was killed by a bite to the chest while doing a snake show with a king cobra. He died in less than 10 minutes. 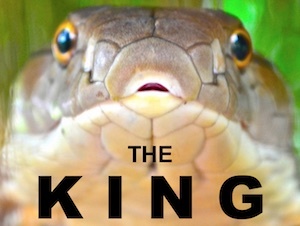 Kings are rather slow to bite, but if you are within striking distance, and they think you are a threat, they might feel threatened enough to strike. A captive King Cobra at a snake show in Southern Thailand. Ophiophagus hannah. These are usually quite dark brown, black, or dark grey snakes that are very fast strikers and movers. The Monocled Cobra’s venom is much more lethal than the King Cobra’s venom, so only a very small amount is needed to cause death in humans. I met a woman who lost a husband recently, due to a bite on the man’s toe when it came out from under an outdoor refrigerator as he opened it to get a beer. The venom is both necrotoxic and neurotoxic. First the man who was bitten lost his foot to necrosis. Then up to his knee. Then his entire leg, and the doctor assured him and his family – he would be fine now. He died days later. Monocled cobras are quicker to bite than king cobras and are exceptionally dangerous. Do not mess with this snake. Juvenile Monocled Cobra – Naja kaouthia in Southern Thailand. Color varies from dark black to grey to brown. Deadly venomous snake. Naja kaouthia just might be my favorite snake… Monocled Cobra. Banded Kraits are yellow and black snakes which are active at night. During the day they are usually quite docile. Some are foolish enough to hand hold them during the daylight hours. Show this snake more respect, its venom is quite lethal and kills people each year in Thailand and other countries in Southeast Asia. Bands can be yellow and black, white and black, or even with longitudinal (yellow adn black striped) instead of banding due to genetial anomaly. 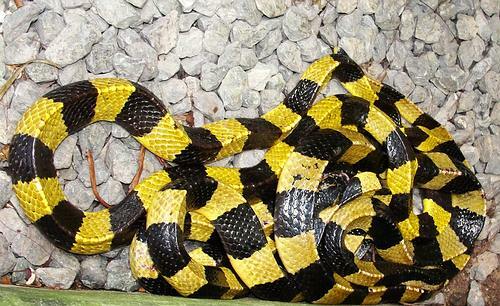 Banded kraits can be yellow and black or white and black. They have a very high vertebral ridge. Bungarus fasciatus. Stronger venom than the Banded Krait, but not as lethal as it’s sister – the Multi-banded Krait, that looks very similar. 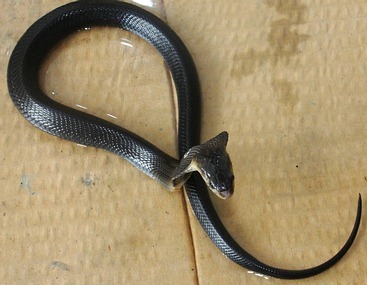 Malayan Kraits are generally not interested in biting, but they have one of the most toxic venoms of any snake. Extreme caution is recommended. 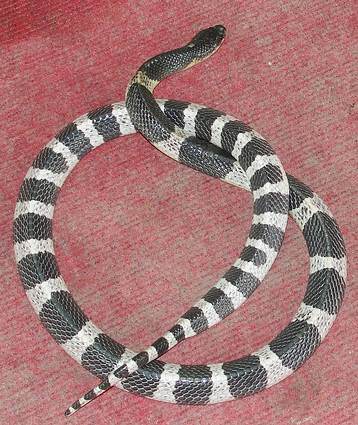 Malayan Kraits come in black and white and have thick bands of alternating white and black. This one is flattening itself to appear larger. 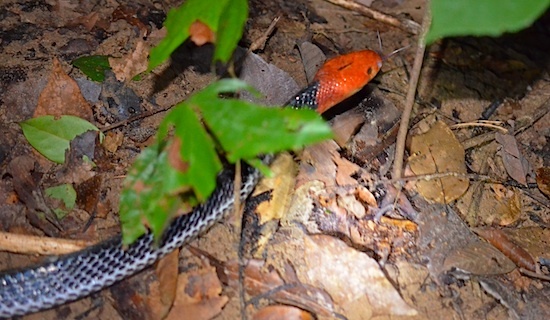 The Red-headed Krait, is seen as often during the day as night. These ultra-lethal venomous snakes are quite rare to find at all. I have seen just two in nine years of looking for snakes in Thailand. Most people never see one in the wild. Their venom and behavior has not been well-studied but their venom is very toxic, like the other kraits. A small, less than 10-inch snake called Bungarus multicinctus killed famous American herpetologist, Joe Slowinski while he was on an expedition in Burma and far from a hospital with respirators. He died within 30 hours from the Many-banded Krait bite. These snakes have venom which is in the top 5 of the most lethal territorial snakes in the world. These snakes look very similar to the Malayan Krait, but they have more bands. 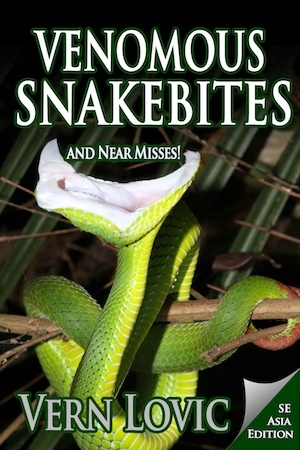 HAVE YOU READ THIS SNAKE BOOK YET? HIGHLY RECOMMENDED! One of Top Snake Biologists in the World is in Burma and is Bitten by a Krait… Great Story! 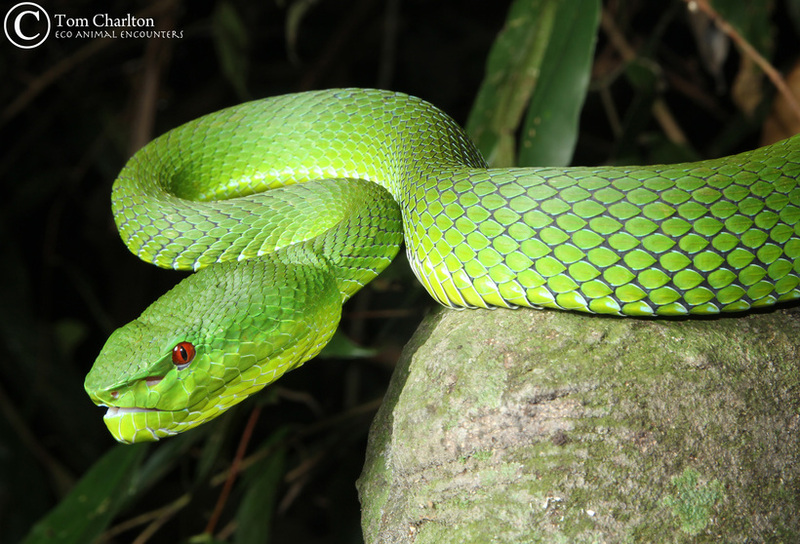 One of Thailand’s most deadly pit vipers – Malayan Pit Viper. Deadly necrotoxic venom. These snakes have the distinction of killing the most people across Thailand of any other snake. Malayan Pit Vipers have large heads, very large fangs, and a strong bite that can inflict deep wounds filled with venom. These snakes love the grass and light cover. They tend not to move at all when approached, and don’t give any noise before striking. Usually people die when they don’t get hospital treatment quickly. The venom is primarily hemotoxic and the victim bleeds from orifices on the body – as well as from the brain. 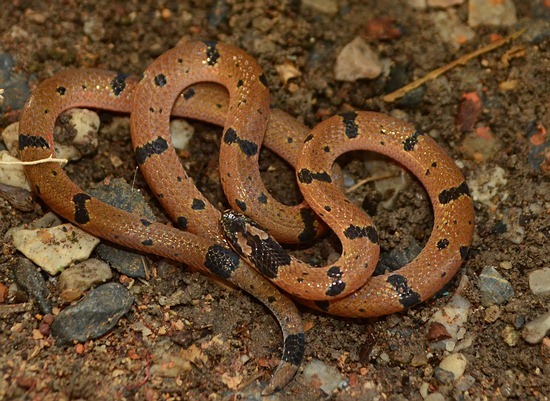 Found north, west and east of Bangkok – this snake is not to be found in southern Thailand. Siamese Vipers kill more people across the globe than any other. Like the Malayan pit viper these vipers are very strong, thick, and have large fangs. Siamese Viper – Daboia siamensis is a deadly Thailand Snake. Image used with permission. Thanks Mike! And she is a beautiful snake too! In the header of this website is a photo of what I think is the first venomous snake I saw in Thailand – the Trimeresurus venustus, the Beautiful Pit Viper. 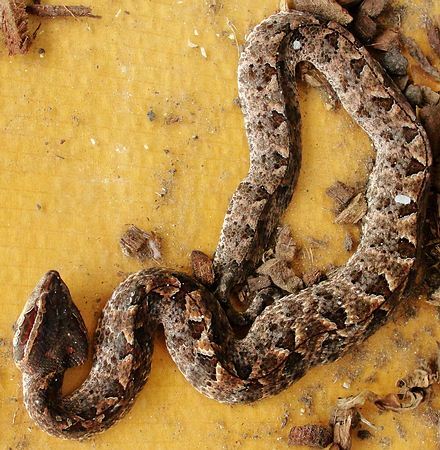 These are small vipers with very small scales – especially on the head. They are not so deadly, but you will have strong local reaction to the venom. The Brown-spotted Pit Viper, aka “The Beautiful Pit Viper” hanging over a culvert edge waiting to ambush prey. Beautiful Pit Viper – Trimeresurus venustus. Stunning in person. The image I use in my header at the top of this page is also the T. venustus – Beautiful pit viper. Very rare and found only in and next to the Kanburi province of Thailand. Very similar in appearance to the beautiful viper. Wagler’s Pit Viper – beautiful! Used with permission given by Emilios Kattides. Wagler’s Pit Vipers are common in Phuket, and called by some, “The Temple Viper.” These are incredibly stunning snakes to look at. Their patterns are diverse. The photo above is a female. The male is about 1/4 the thickness, with a green overall color and red/white spots. Female Pope’s Pit Viper. Copyright Tom Charlton. Photo used with permission. Sorry, no image could be found. A father sent me photos of a snake that his young son was kicking at while they visited a waterfall on the Thai-Burma border in Phang Nga province. These are rare in Thailand, and have a nasty bite. Luckily, his son was not harmed. Indo Malayan Mountain Pit Viper. Used with permission from Stewart King. Ovophis monticola. These are pretty elusive. They spend time in mangrove areas near the ocean, and I’ve yet to see one in the wild. They are big biters and not docile at all. 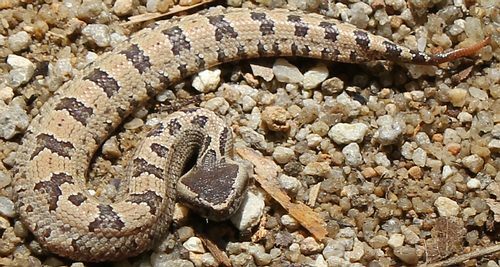 Be careful if you come across one of these small vipers. 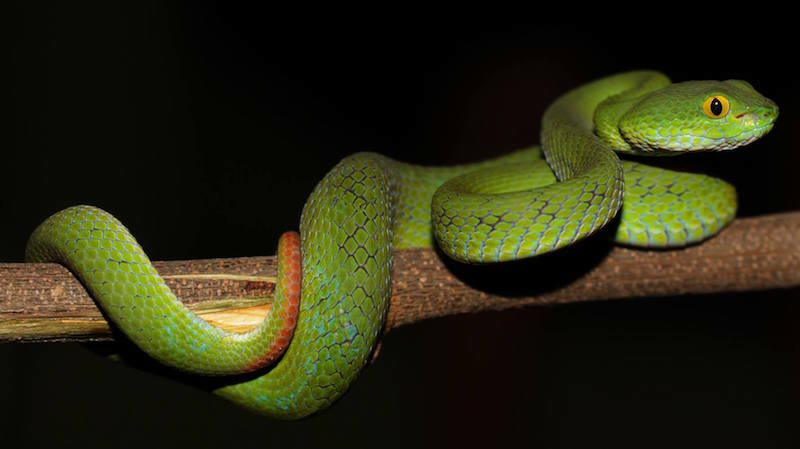 Mangrove Pit Vipers are beautiful – but dangerous. 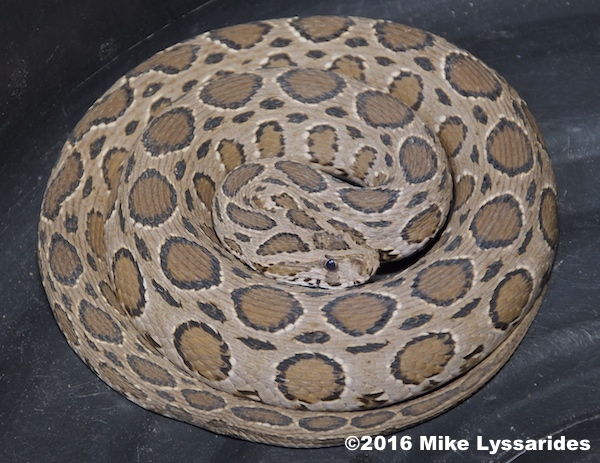 Mangrove Pit Viper – used with permission from Richard Richert. Trimeresurus purpureomaculatus. As the name implies, the eyes are large on this green pit viper. Green pit vipers in Thailand are quite difficult to tell apart from each other. Be careful with all of them. Large-eyed Pit Viper (Trimeresurus macrops) by David Frohlich. Used with permission. Venomous and potentially fatal bites. Very dangerous and hard to identify. 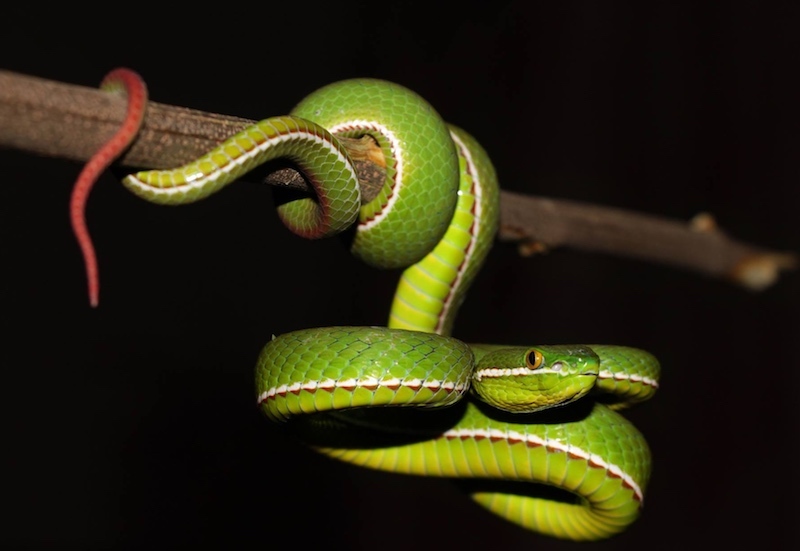 A very beautiful pit viper as the pictures show. A male White-lipped Pit Viper photo by David Frohlich. All rights reserved. 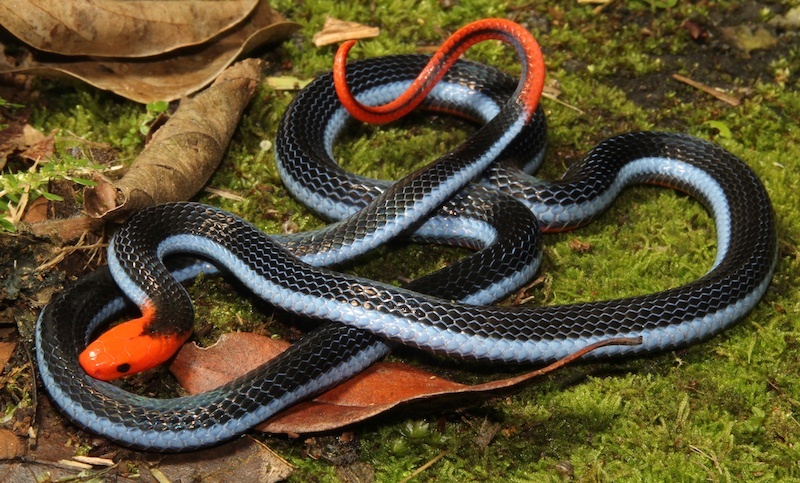 A stunning Blue Malaysian Coral Snake found by Tom Charlton. Rare snakes in Thailand. Thanks Tom! 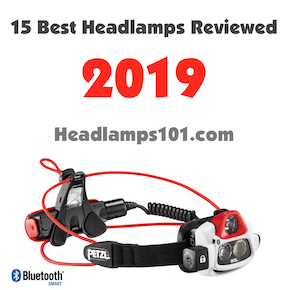 Very interesting and useful when I am working in the garden in Ban Phe, Thailand. I have seen all these snakes.i live in the mid of rayong and ban phe. You mean Ranong (Rayong is on the east coast of the Gulf of Thailand). Yep, you’ve got your share of venomous and quite deadly snakes in Australia. Up north there are cobras including the king cobra. There are kraits – Malayan krait, and possibly the many-banded krait – the most potent venom of any snake found in Thailand. There are a number of vipers, and maybe including the Mountain Viper. I don’t know if the corals snakes are up there that far, but I wouldn’t doubt it. I don’t have a geographical break down specifying which snakes are found where. Would be nice, but on the other hand, so many snakes are found outside the range that it probably doesn’t make sense to even put the time into that sort of thing. Assume all Thailand snakes are to be found in your region. Send pics when you get them…. Cheers man! Hey I found this snake in a log in my apartment and was wondering what it is if you email me I’ll give you a picture of it i don’t know how to post pictures here. I live here in Kanchanaburi Thailand with my wife Nong, this morning I went into the front garden to feed the fish and came across a 5 foot shinny black snake. When it saw me it took off. I called out to my wife Nong but by the time she got here the snake had disappeared. QUESTION… IS A SHINNY BLACK SNAKE 5 FOOT LONG POISONOUS…??? Question – are you going to eat it? Poisonous means you’re going to suffer ill effects from eating it. Venomous means it can kill you with envenomation – biting and injecting venom. It could be venomous – yes. Could be a cobra. Do be careful. Sorry, you gave me little to go on. There are many snakes that fit that description. Informative website. I’m planning a trip to Thailand to train at a Muay Thai camp, possibly Fairtex. Is this snake issue something I should be overly concerned about or conscientious of? I think I have a baby Malayan Kraits. I am in Chiang Mai, Thailand and no one here seems to know what it is. If you would like a photo of it, just tell me where to send it. I don’t want to kill it, but I don’t know how dangerous it is. When I was living in Krasang (About 20 Kilometers West of Surin) I had a Snake coiled up on the edge of my field, it was about 1 1/2 feet long (maybe less) with an dark emerald green back and a yellow belly. It had no fangs but sharp teeth that bit into my leather glove and to be honest, it probably would have let go if it’s teeth weren’t hung up in the leather. I cannot find any pictures that looked like it. Would you have any idea as to the name? I live in Chiang Mai, Thailand, and a couple nights ago, I killed a small (10 to 12 inches) snake. It was black with thin yellow bands, and a white underbelly. The only thing I can find online that looks anything like it is the banded krait, but the yellow stripes on that are too thick. Do you have any suggestions what it could have been? Laotian Wolf Snake – Lycodon laoensis, possibly. I think you wrote me on the facebook forum already – and it was Ptyas korros – the Indo-Chinese rat snake. Is that right? Great info on venomous snakes. Currenty in south Thailand living on a rice farm about 70km south of Nakhon si thammatat. Went to the toilet this morning and found the back side of a snake slithering down the pipe to go outside. Only saw the last 3ft of it. But the description is of a dark green with a what I can only describe ad beautiful pattern and vivid pattern on it’s skin. Please get back to me as to what you believe it to be as I haven’t found anything that looks like it. Thanks mate ! My Wife I stayed in a luxury hotel in Thailand. The rooms were like shack cottages on the outside but 5* inside – right on the beach and over a lake – lovely. We returned to our room one night and a snake about 0.7m long and perhaps 25-35 mm dia was on the floor it reared round and headed straight at us with some speed. we left the room sharpish and shut the door and called housekeeping. They came down and I went in the room with them, then when I said it was jet black one guy jumped on the bed and the other legged it (they were barefoot to be fair) they wouldn’t let us stay in the room and we had to move. 5 days later we returned to our new room about midnight and when passing the original room a family of Swedish people had been evacuated from the room, it was midnight and they were waiting outside, they had escaped after being chased by a snake in the room. Any ideas? jet black, shortish skinny snake, fearless and had the Hotel staff paying lots of respect to? I just moved to Pai. I own Pai Adventures which is a white water afting and jungle trekking outfitters. What snakes to I have to worry about in Mae Hong Son province? Hey I am thinking about going to University in Thailand, I feel like i may rent an average place and i have heard they go in houses often doesn’t matter if your not on the bottom floor they can come up trees to the windows or even get into plumbing and strike while your on the toilet. Seems scary and i don’t like snakes. I know you said don’t sleep outside and walk with a flashlight but do u think if i have a cat and or dog i can feel 100% safe living in thailand? What do you do check your toilet and shoes every time, have a pet? How can you be safe for sure? Found this thin long snake on my drive in Na Jomtien. My husband said he saw our cat jumping up and over a hedge bush in or garden then obviously tried to lay with it. Maybe just a baby snake green and yellow striped with black square markings – any idea what it is and is it venomous? No idea by that description. Send a photo to me at the contact page. We had a very thin long( 3 meters) green snake (mottled) with a brown tail in our garden. My Thai wife says it is venomous but my info says it is mildly venomous and cannot kill you. We gave it plenty of space. We believe it is coming for small birds’ eggs. Can you identify it ? Hi Greg, I don’t know of a 3 meter long snake with mottled green and a brown tail, unless you’re talking about a king cobra? How thick was the body? 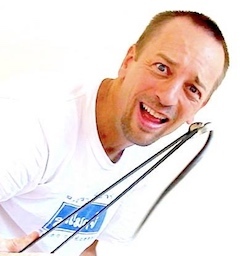 Hi Vern, I live near Pattaya and a snake came into the house whilst the wife and I were watching TV last night. It was very dark grey, no markings, large scales, pale grey on the underside, 60-70cm long, 2cm in diameter, short taper to the tail. The head had a bit of a triangular shape and was not slim like the indo-chinese rat snake which I have seen, nor did it have large eyes. It moved slowly with a very wide S shape and was non aggressive. It did not hiss. (It got itself stuck headfirst in the track of the patio doors). The wife went apoplectic when I tried to pull its tail to get it out, so I used a stick to shuffle it backwards until free. I flicked it into the garden. It seemed totally unphased. Any idea as to what it might have been? Cobra? Wolf snake? Hard to say! Yep, they are hard to miss – and yeah, can make you jump too. Where are you at – which province? Hi, we are going to visit Umphang in Tak province very near the Myanmar border and will be visiting jungle villages. Can you advise us on which snakes live in this area please . What other creatures may harm us may there be scorpions as well as mosquitos. Mosquitos are by far the greatest threat. However, they have tigers and elephants, I believe. Snakes – cobras, pythons, vipers, kraits. Don’t walk at night without strong lights so you can watch every step. Stay alert… not sure what else to say. Iyellow snake with black dots maybe 80 cm long in the swimming pool roof garden in soi 28 sukhumvit central bkk. How she got up here is the mistery! Maybe the Chrysopelea ornata – Golden Tree Snake. Our INFO PAGE is here on that snake. Cheers! are any of these snakes prone to be active in very hot weather during the mid day? I have been building ( clearing some trail for mtn bike usage) in Chaing rai area during the day, raking dead leaves down to dirt for a path and cutting bamboo shoots and chopping/hacking vines. Have been out the past four days in a secluded area, and seen ZERO snakes after moving hundreds of bamboo shoots on the ground and clearing a trail two to three feet wide completely down to dirt for more than 800 meters. I’m wearing some pretty thick boots with carhart/ type jeans. Got any suggestions on how to snakeproof myself more thoroughly or what specific snakes I can run into while raking thru the forest and moving bamboo? Perhaps I”m very stupid, just let me know. I can take constructive criticism. Hi Bill, great comment – thanks for that. I know the monocled and spitting cobras are VERY active in the heat of the day. They ramp it up as they get hotter. In fact, I see monocled cobras here in Krabi at 3 pm. usually because it’s the hottest part of the day. Vipers are active at night, but sure, the Malayan Pit Viper could sit under some leaves in the heat. With boots – you’ll most likely be fine. 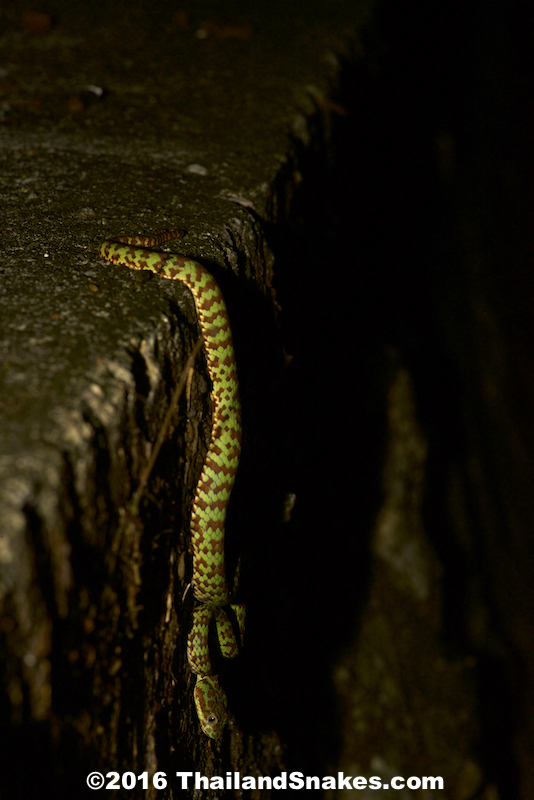 The malayan pit vipers don’t strike above the knee – ever (from the ground). Cobras, you can usually see because they give notice – with the hooding and hissing. Cheers man – hope that helps. Dear sir – I stumbled on this page and struck by your kindness to answer each question. You seem very well educated and providing such a good service. I just wanted to say thank you for the interesting reading and what you’re doing for your readers. By the way, I live in Minneapolis, Minnesota and recently met a woman from Thailand. I am breaking up with her immediately. Ha ha. Any idea what it might have been? Is there likely to be a nest nearby? The Rentokil guy who sprays for bugs found it & took it away he didn’t seem to know a lot about it, in fact he said he thought it was a toy when he first came across it. What’s the gestation period for most snakes? Hi, we are staying on Koh Phayam and yesterday we experienced the first bit of activity outside of the relaxing, slow paced life that dominates here. The commotion was caused by a 2.5 Metre! Long snake in a souveniour shop. It was grey in colour and it’s markings weren’t overly distinct. It’s belly was lighter in colour, and a bit white/yellowy/beige/dull green kind of colour. The locals were very very very cautious of it and a local man, with the right tools, managed to capture it. It’s head was relatively large,compared to the girth of its body, but from what little I know, pit vipers don’t grow that big. For a snake 2.5 metres in length its body was relatively thin, only about 2-2.5 inches across, max. There was no hood from what I saw, so King Cobra seems out. It moved extremely quickly, and I mean really fast, but it then stopped and wrapped itself around a manaquin’s leg and reared its head up about a a foot and a half off the ground whilst smelling the air vigorously with its tongue. My intrigue was great but my instinct was to not get too close and let the professional handle it. I’ve looked at several sites but nothing seems to match the description. The best I can come up with it a pit viper in colour but the length seems to long. My 3 year old son lives with his mother in Sawang Daen Din, 90km South of Udon Thani. He was playing in the yard near our fish pond last night when he suffered a strike from an unknown snake on his lower leg (maybe 10-12 cm from the base of his foot on his calf). Fang marks are approximately 2.5-3 cm wide. He was complaining of leg and foot pain and after his mother noticed the fang marks rushed him to hospital. Thankfully it was a dry strike. My son could only say that the snake was black; as he is only 3 so not the most reliable witness. With the very vague description provided and given the region in Thailand any thoughts as to the species responsible? Last night what time? Can you send me a photo of the bite area? Any stomach upset, dizziness, eyelids closing???? I found a small (but long) snake in my bathroom that is black with small green (maybe yellowish) markings on it, not really in any pattern, with a lighter underside. We get small scorpions in our bathroom too, and I’ve heard of some snakes that prey on the scorpions. I don’t have a photo, nor could I find one searching the internet. Do you know what this snake could be? Venomous? I’m mainly concerned to know for letting my daughter use the toilet by herself or not. Thanks. 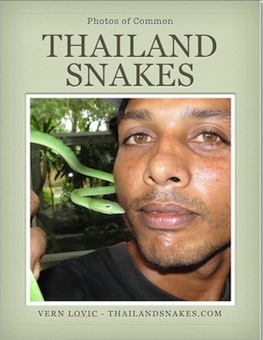 I used to live on Koh Lanta and we once ‘caught’ a King Cobra snake that was almost 6 meters long. I say we, I mean we called a professional who came to help us catch it.. It’s scales were as big as guitar picks.. Scary stuff! But the snake didn’t really want to attack us, even though my husband and friends tried to get it out of our recycling bin, they quickly gave up though when they saw how big it was!!! Yeah, I’d be pretty cautious with something approaching 6m. We found a tiny snake in our apartment yesterday. It’s short and very thin with green and black stripes. Do you know what kind of snake it is and if it’s dangerous? Hard to say without a photo. The only green/black snake I can come up with with “stripes” is one of the rare rat snakes just recently found in Chiang Mai and far north. The golden tree snake has what appear to be bands, or checkered black and greenish. It’s harmless. Is this the snake – Golden Tree Snake ?